Work safely around electrical hazards and avoid tragedies on the job. Get up-to-date on electrical safety requirements and save 15% with the 2018 edition NFPA 70E® and Handbook Set. Protect personnel from potentially deadly electrical hazards with guidance and advice direct from NFPA®, the NFPA 70E and NEC® source. OSHA is the "what" and NFPA 70E: Standard for Electrical Safety in the Workplace® is the "how" behind saving lives, reducing injuries, and satisfying OSHA mandates for electrical safety. The companion NFPA 70E Handbook for Electrical Safety in the Workplace provides advice and visuals that assist facility managers, electrical personnel, and business owners responsible for ensuring an electrically safe working area and complying with OSHA 1910 Subpart S and OSHA 1926 Subpart K.
Order your 2018 NFPA 70E Set today and help make sure everyone goes home safe at night. Get up-to-date on electrical safety requirements and save 15% with the 2015 NFPA 70E® Set! OSHA is the "what" and NFPA 70E: Standard for Electrical Safety in the Workplace® is the "how" behind saving lives, reducing injuries, and satisfying OSHA mandates for electrical safety. A major shift in the 2015 NFPA 70E changes how stakeholders evaluate electrical risk, and the 2015 NFPA 70E: Handbook for Electrical Safety in the Workplace helps you understand and apply requirements. This essential Set assists facility managers, electrical personnel, and business owners responsible for ensuring an electrically safe working area and complying with OSHA 1910 Subpart S and OSHA 1926 Subpart K.
Order both resources together and save! Order your 2015 NFPA 70E Set today and keep America electrically safe on the job! Protect your workers and your company's reputation for safety. Contractors, risk managers, engineers, building managers, and owners all have a stake in ending electrical-related accidents, liability, and loss. Meet the highest standard for electrical safety and save 15% with the 2012 NFPA 70E® Set! Do all you can to protect workers from electrical hazards. 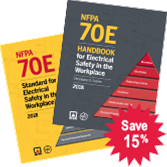 The 2012 edition of NFPA 70E: Standard for Electrical Safety in the Workplace® helps you reduce risks and avoid devastating electrical incidents that result in injuries, deaths, and OSHA violations. You'll be ready to apply new safeguards correctly and efficiently with the 2012 NFPA 70E: Handbook for Electrical Safety in the Workplace. Order both resources together and save! Help keep your workplace electrically safe with the included 2012 NFPA 70E Permits online tool. This copy of the 2012 NFPA 70E, includes access to NFPA 70E Permits. This online tool includes interactive lookup tables, an energized electrical work permit generator, and quick and easy look up of your saved permits. Learn more about 2012 NFPA 70E Permits here. Order your 2012 NFPA 70E Set today and help change the way America works! Protect your workers and your company's reputation for safety. Contractors; risk managers; engineers; apartment, commercial, and retail building managers; and owners all have a stake in ending electrical-related accidents, liability, and loss.